No doubt you are familiar with the Seven Wonders of the Ancient World. The Pyramids of Egypt, the greatest of which covers 13 acres with the original height of 481 feet. Over 2 million stone blocks went into it, each block about 40 cubic feet in size and 2 1/2 tons in weight. The Hanging Gardens of Babylon, erected per order of Nebuchadnezzar to the honor of his wife. This consisted of five gardens set in the form of a square and rising to the height of about 75 feet. The Statue of Jupiter, by Phideas; a huge figure of gold and ivory, erected at Olympias. The Temple of Diana at Ephesus, built about 400 B.C. of exquisite Persian marble. The location of this temple was discovered by archeologists in 1869. The Mausoleum of Halicarnasses, built by Queen Artemesia in 353 B.C. as a magnificent burial place in memory of her husband, Mausolus. Valuable bits of architecture and sculpture were located at the site by a British expedition in the 1800s. The Colossus of Rhodes; an immense bronze statue representing Helios, the sun god. It is said to have stood in the Rhodes harbor entrance in such a manner that ships had to pass between the legs while entering. It was destroyed in an earthquake. The Pharos; a lighthouse built by Ptolemy II (309-246 B.C. ), on an island in the Bay of Alexandria, nearly 400 feet high and resting upon a 100 square foot base. An earthquake in the A.D. 1300s destroyed it. Seven wonders, with what magnitude of accomplishment! And yet, in a very solemn sense, there is nothing of worthwhile wonder about any of them. For they are all of the past, without a single voice of significance for the hungering needs and longings of the hearts of men today. They are all old and silent, without answer to the pressures and perplexities which encompass us upon every hand. There is another Wonder of the ancient world, far greater, far more important, than all those seven put together! Another Wonder which belongs to all time, and cries out with a clear voice of hope for all men, whatever be their station. 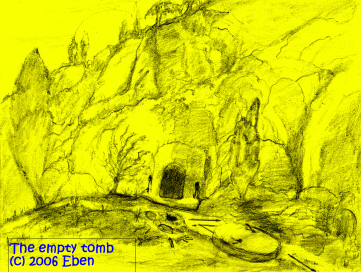 This is the Wonder of Easter's Empty Tomb. There can be no greater blindness than turning away from the empty tomb, with its marvelous message more relevant and realistic than tomorrow's newspaper. And what a wonderful salvation He offers in grace, mercy, and limitless love! May this very moment be for you the blessed beginning of an "everlasting Easter."--E.R.A. You may order this tract by writing to the American Tract Society, Oradell, N.J. 07649.